I’m not a financial advisor, but I’ve studied investing for a while and recognize that it can be a fairly complex issue. Investing comes across as so complex, that people end up not investing at all. They don’t diversify their investment. They don’t allocate their investment appropriately for their specific situation. To those of you that are not investing at all, you need to start. Please. Those of you that are investing, if you’re doing average, need to contribute a lot more, as soon as possible. The average baby boomer (people between the age of 49 and 66) has a retirement savings of $88,000. If they don’t have a qualified retirement plan, their average retirement savings is $38,000. People, we need to step to it! 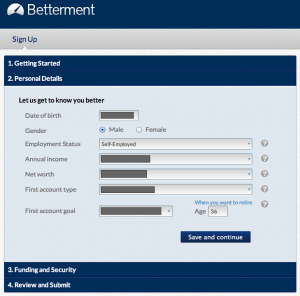 Betterment makes starting and accelerating very easy. This is one of the reasons I really, really like their service. I don’t want to get into all the ins and outs of diversification. Just follow the old adage, and don’t put all your eggs in one basket. In Monopoly, would you rather own Boardwalk and Park Place completely, or own a percentage of every other property on the board? No matter what happened, you’d make some money. Instead of having really big peaks and valleys, you’d have much more even, steady growth. By picking the right group of investments, you may be able to limit your losses and reduce the fluctuations of investment returns without sacrificing too much potential gain. 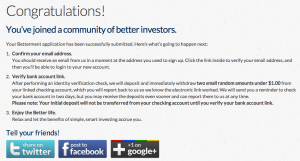 Betterment makes diversification easy. Even if you don’t understand every in and out of diversifying, you can rest assured that they do. They diversify in a very simple, transparent way. More on that later. Cash. We all get this one. The more you have, the better. Cash can be stored in a checking or savings account, where it’s virtually risk-free. What’s the risk of your cash losing its value? Essentially zero. (Let’s avoid inflation, and please avoid hyperinflation discussions here… maybe we’ll get into that in another post.) 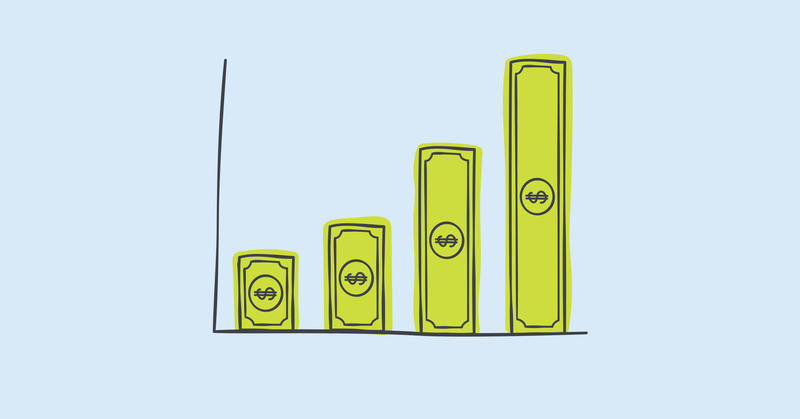 Does your cash earn a lot more cash? No, because you’re not subjecting it to any risk. Stocks. Some of you get this. Others don’t. When you purchase a stock, you become an owner in a company. If you wake up the next morning, will your stock still have the same value? No. It will go up. It will go down. You don’t know. Stocks are subject to risk, so their potential return is higher. Bonds. This is where you give a company or government your money, and they promise to pay you back. You’re a lender, they’re a borrower. Is your money at risk? Absolutely. Some bonds are riskier than others. US Treasuries are seen as riskless, so their return is low. Junk bonds are seen as risky, so their potential returns are higher. So regarding asset allocation, would you want to be 100% in cash? Well, probably not, because your return would be really, really low. 100% in stocks? Maybe not, because your risk would be too high. 100% in bonds? No…because your return might still be too low. But what about a mix of all three? That’s where it gets interesting. And that’s asset allocation. If you need your money tomorrow, you should be in cash, right? Zero upside, zero downside, and that’s great because you need it for groceries in the morning. If you need your money in five years? You’re okay with a bit of risk, because you don’t need it for groceries in the morning, but are you okay with it being 100% in stocks? I don’t think so. Too risky. We’ve seen that stocks can be flat, or down, for years. So maybe you’d mix it up and lean more toward a conservative bond set, and some stocks to still catch potential upside. What if you need the money in 20 years? Let’s take some risk! Over the long haul, stocks have proven to be fantastic investments. With 20 years to go, you can ride out the downs and hope for a larger return than you would have gotten in cash, or bonds. Whew. So much for making the asset allocation explanation short. 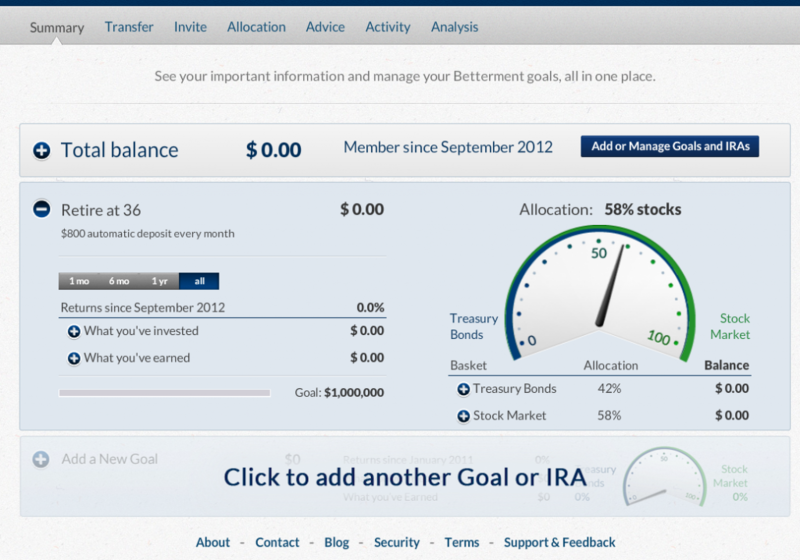 Betterment does the asset allocation bit automatically based on your time horizon. They let you explore different scenarios (based on solid historical data, which is not an indicator of future results, but at least a starting point), adjust your horizon, and even set different goals at different time horizons. For example, your daughter will be getting married in 20 years. Yes, I know I’ve mentioned this a lot in the podcast. Because it terrifies me. I could set a target date in the future for when I would allow my daughter to be married, and Betterment would rebalance my portfolio as I approached that target date. Being 20 years out, we’d invest the funds aggressively. With five years to go, the funds would be invested more conservatively. And of course, six months before the wedding the funds would be in cash. And then the funds would be consumed with vigor until only dollar dust remained. 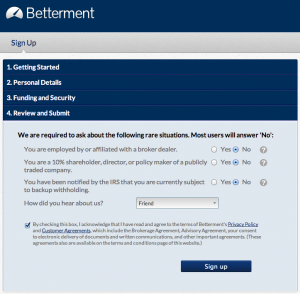 If you’re intrigued by how Betterment solves the starting, accelerating, diversifying and allocating problems associated with investing, but don’t care to see all of the details in my account setup, and associated thought processes, then you can stop here and go check out Betterment yourself. If you want to get into the nitty-bo-bitty-gritty, please read on. I’ll walk you through the sign-up process, highlighting what I love about their interface, especially the clarity of fees, and performance. We’ll cover some under-the-cover stuff re: what they’re investing in, talk about some Betterment alternatives (of which there is no shortage) and then (finally) offer some final thoughts. 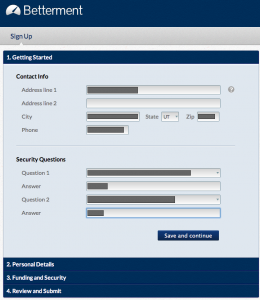 Standard address and security questions for password recovery. You’ll notice that they have you set up your first goal here. As mentioned above in Part I, Betterment is goal-oriented. 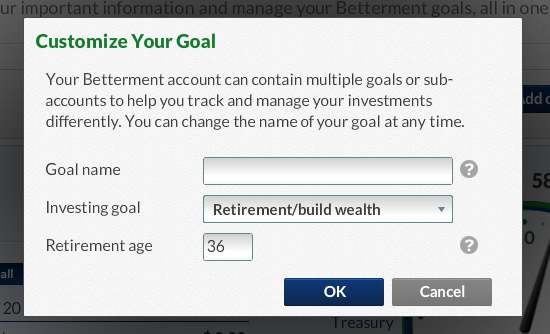 I set up my first goal to retire in five years. Hey, one can dream. Favorite part of that is the helpful, plain-language explanation that doesn’t leave you guessing at all as to what’s happening. And for you high rollers, sorry, but the maximum funding amount at one time is $100,000 USD. You’re left with a few steps you can do at your leisure: 1) confirm your email address, and confirm the bank account you’ll use for funding. 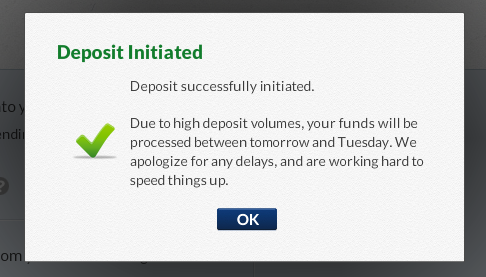 This is pretty standard stuff if you’ve ever signed up with any other brokerage, online savings account, or Paypal. 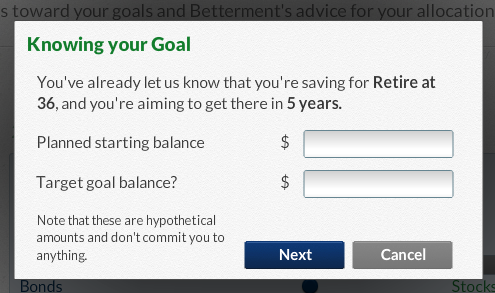 You’ll notice how I had said that my goal was to retire in five years, right? Since Betterment does our asset allocation based on our goal’s timeline, you can see that it picked a 58% stock market mix—enough to still earn some returns, but not enough that in five years I’ll be wanting to see my principal, and we’ll be in a down year (or five years). So Betterment then does some number crunching in their back room, and calculates (based on historical performance, and my given asset allocation of 58% stocks, and the rest in bonds) that I’ll need to save $14,246.45 per month if I’d like to hit my target. So I mess with the slider. 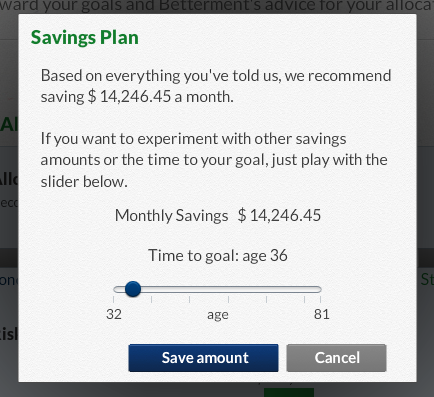 Okay…I want to retire when I’m really old. 40. Isn’t the underlying calculation cool though? Even if it is a wee bit unrealistic? Betterment has us focused on the one thing that we can control — What we put in. I know you can’t put in as much as you want, as you’re restricted by life’s other obligations, but this at least gets you focused on the number you can influence over the long run: your investing efforts. I really like that the focus is here, and not on the return side of the equation. That $6k is pre-filled in, and I set it to hit monthly (I adjusted this later to my actual amount, which unfortunately is well below the $6k mark). Okay, this isn’t that exciting since I took these screenshots before my $800 deposit landed, but still…this is fantastic clarity. Your fees are right there, in one place. The cost of an investment is one of the most significant drivers of your investment results, so it cannot be ignored. Betterment’s fees are extremely straightforward, and have actually come down significantly from when I originally talked with them a year or two ago. Their fees, beforehand, were the sole reason I didn’t recommend them to YNABers earlier. Now that they’re extremely competitive, well, here’s my recommendation. 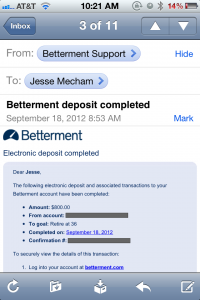 Betterment – No transaction fee. 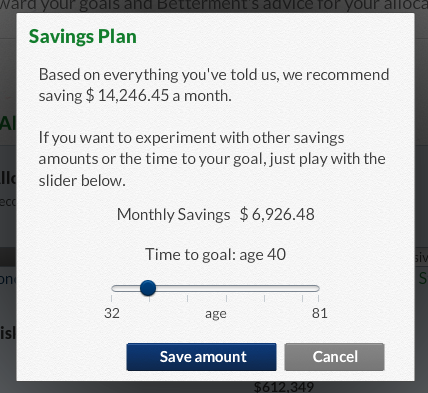 .35% if you deposit $100 per month with no minimum balance requirement. 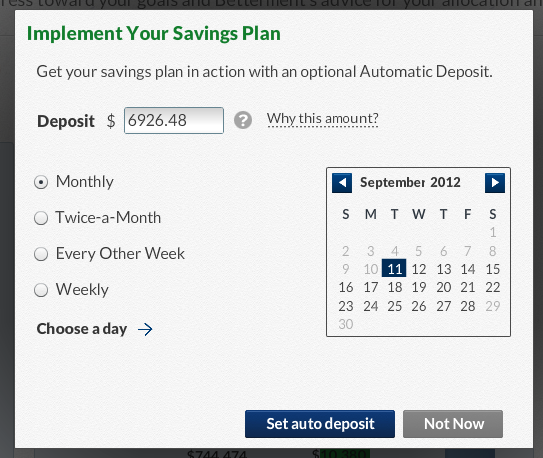 If your balance is at least $10,000 then you don’t need to do an automatic deposit and your fee is .25%. If you’re a high roller with a minimum balance of $100,000 or more, it’s .15%. Wells Fargo – I have a PMA package with Wells Fargo. I bank almost completely with them — both business and personal. And it’s a love-hate relationship. I love that it’s all in one place, and I hate that Wells Fargo is a massive bank that doesn’t care one iota about me and my tiny problems. At any rate, because I’m a PMA customer of their’s, I get 100 free trades per year with their brokerage arm. There are “potential account maintenance fees” but I think those are waived for me as well. For the ahem little guy, they charge $9 per trade and $35 for no-load mutual funds! 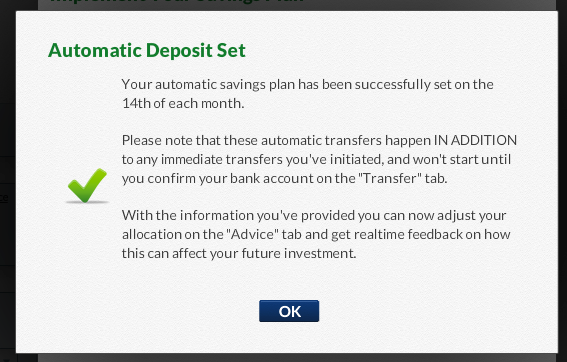 Also, the account maintenance fees really annoyed me. Either get me coming, or get me hanging around, but don’t get me both ways. 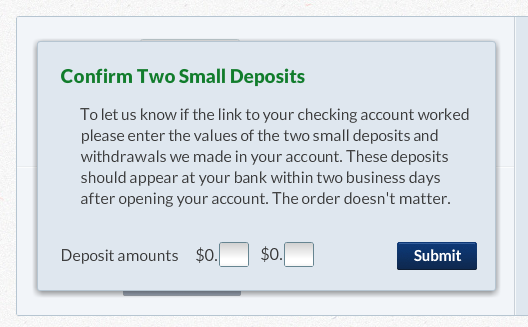 Honestly, I should use Wells Fargo, but I just don’t want to because of that PMA status. But I’m not. The main reason has to do with automatic asset allocation (which you can read all about way down below). E-Trade is also very popular. I haven’t used them personally but their pricing page was like reading a Tale of Two Cities. The short of it: $10 per trade, or $8 if you trade over 50 times per month! Please don’t trade that often 🙂 Based on that pricing, I don’t see a reason to use E-Trade over Scottrade. Sharebuilder is owned by ING, which is owned by CapitalOne, which is why I don’t really recommend ING anymore 🙁 (I’ve been doing some research into some other online banks, because I used to recommend ING a lot, and it’s promising. I’ll write more on that later.) Sharebuilder has great pricing where it’s $4 for stocks and ETFS, and $0 if you auto-invest with certain fund families. I’m not a fan of the restriction on fund families, but that’s not the end of the world. If you don’t do auto-investing, it’s $20 per mutual fund transaction, which is pretty steep. Vanguard is the leader in low-cost investment options. I like them a LOT, but wish they were less intimidating for new users. Their pricing is fairly complex, where, based on how much you have invested with them in total, the fees can change substantially. Also, please elect to go paperless if you want to avoid their annual $20 fee. (You should go paperless anyway, people! :)) If you want to recreate what Betterment gets you, it would be $7 per trade with Vanguard. Again, a per-trade fee would not be ideal if you’re doing low-dollar amounts. Don’t worry too much about digging into the why behind the breakdown. I just want you to see that 1) there’s a very good mix of investments, spread across the globe, and that 2) these investment choices are fairly inexpensive (ETFs, as a rule are). A quick note on ETFs, they are indexed to a basket of stocks, but trade like a single stock. So when I buy a share of the iShares S&P 500 Value, I’m buying teeny tiny slices of stock of every “Value” company on the S&P 500. What’s that mean? Don’t worry about it. Just know that when you buy an ETF, it’s like a stock of a bunch of pieces of stock. It’s extremely liquid, and very cheap. This portfolio handles the problem of investment diversification in one fell swoop. Yes, you can diversify on your own, and yes, that’s more difficult and time-consuming (but I’ll show you how later). The allocation with Betterment was discussed at length above. The gist of it is that as you approach your target goal, your fund is invested more conservatively: less in stocks, more in bonds. The mix would be fairly easy to alter with some quick spreadsheet work (which we’ll do below). As a quick example, if I was invested 50/50 in Stocks and Bonds, based on the Betterment portfolio, I would own 12.5% in VTI…12.5% in IVE..and on down to 3.5% in IWN. In the bonds, I’d own 25% TIP, and 25% SHY. I just multiplied 50% against the weight of each ETF in the allocation. Now, when you invest in ETFs, you do pay a fee. As mentioned above, they’re very reasonable. Cheaper than most mutual funds by a long shot. So in that Betterment screenshot where it was showing Market Changes, your fee is taken from that. You won’t see it outright, but the value of your investment is basically reduced by the fee amount. Fees are expressed annually when you look them up online. For instance, the Vanguard Total Stock Market Index ETF (VTI) is .06%. If you invest $100 in VTI, you’ll pay six cents. I took the portfolio weights of the Betterment Portfolio, and multiplied them by each ETFs respective fee. The result was that, all-in, the Betterment Portfolio has an “embedded cost” of .158%. If you invest $100 at Betterment, almost 16 cents will go toward the ETF fees and then, based on your balance (discussed above), you’ll pay another 15 to 35 cents annually, directly to Betterment. I’m a Cheapskate so…How Could I Do This for Free? I definitely thought of this. Though I wouldn’t necessarily call myself a cheapskate 😉 Let’s recognize value here, and see if Betterment’s value proposition makes it worth the extra .15-.35% you’ll pay. On starting, or ramping things up, the starting part is definitely easier with Betterment, but the easier UI certainly isn’t the value proposition here. You can set up any brokerage to do automatic withdrawals. So we’re going to call that a wash.
Second, any cheapskate would simply copy Betterment’s portfolio, so the diversification “service” is had for free. 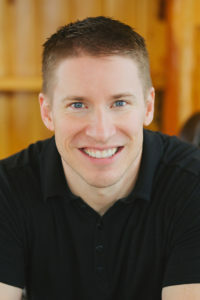 Jon Stein, the CEO, and a Certified Financial Analyst (and a nice guy as well), has done the legwork for you cheapskates! Just copy him! On the asset allocation, this is where Betterment really starts to deliver value. Now, before you say, “I can just reallocate myself!” Know that talk is cheap. People’s heads are filled with the best of intentions (“This year, I’m not going to EVER eat out!”) that don’t make it past Tuesday. So regardless of what you say you do, 80% of you won’t do it, and you’ll end up with a portfolio that isn’t balanced appropriately for your time horizon. Invest in cheap target date funds, (An inexpensive example would be Vanguard’s) (that is not investment advice, it’s jus tan example of target date funds). Those are titled in fancy ways like “Target Retirement 2025″ and they will rebalance appropriately as you approach that year. Drawbacks: they’re only in five-year increments, and many of the target date options out there are more expensive, and actively managed (I’m a fan of passive investing). Handle the asset allocation yourself. So let’s talk about the steps required to do it yourself. You would do these steps every time you purchased more assets, or at least quarterly. Know your target asset allocation. What mix should be stocks and bonds? 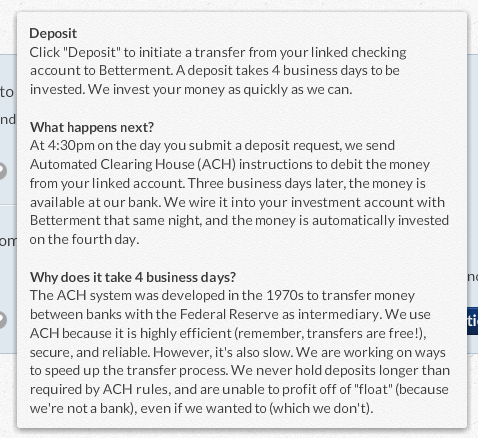 When in doubt, use Betterment’s tools to figure out what they do, and just copy them. Record your current fund balances across all holdings. Calculate your current allocation, based on the holdings. Enter the additional amount you’re investing (if any). Apply the (new) balance to the target allocation from . Compare the difference in the allocation of each fund  to the current fund balances . You’d go through those seven steps every single time you’d invest new money, if you wanted to do it as well as Betterment. I decided to make a spreadsheet to mimic the Betterment portfolio. Read about how I did that, here, if you’re keen on rebalancing yourself. Some of you probably caught on to the problem that’s apparent with rebalancing. You can’t purchase fractional shares. In my spreadsheet example, you’ll see that I should Buy $1,161 of VWO. Well, what if VWO’s price is $32 per share? That means I would need to purchase 36.28 shares. You can’t do that. So you’d round down to 36 shares, leaving you with remaining funds of $10.08. Not the end of the world, by any means, but annoying if you’re a bit OCD like yours truly. 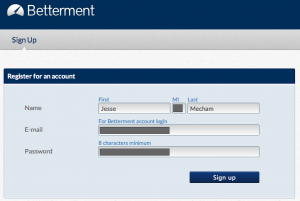 Betterment allows you to purchase fractional shares, so that problem goes away (I’m not certain on the purchasing of fractional mutual fund shares, such as the Target Date funds..if someone knows, please let me know!). If you know YNAB at all, then you know we aren’t huge fans of automating your money so much that you don’t stay involved. With investing, the opposite approach is the appropriate one. I want you automating the heck out of it. I want it out of sight, out of mind. I want you to make the decision once to invest, and then just focus on bringing home lots of bacon! The impact you’ll have on your retirement nest egg if you can throw a lot of money at it, while it’s well-diversified and appropriately allocated, is massive. In the end, what I’m saying is this. If you want something drop. dead. simple, I recommend Betterment. If you want something that won’t confuse or intimidate you, I recommend Betterment. If you want to (pretend to) rebalance your portfolio, and diversify on your own, then I wish you the best of luck. The key is this: You are not, nor will you ever be, a professional investor. You didn’t build your own home, or build your own car, because you found it economical to pay someone to have the skills necessary to do it for you. Betterment is that tool for me. It takes the mystery out of investing, keeps things simple and transparent, and saves me a lot of cognitive overhead. Try ‘em out if you’re so inclined. P.S. If you have built your own car or home, you are awesome, and my idol. 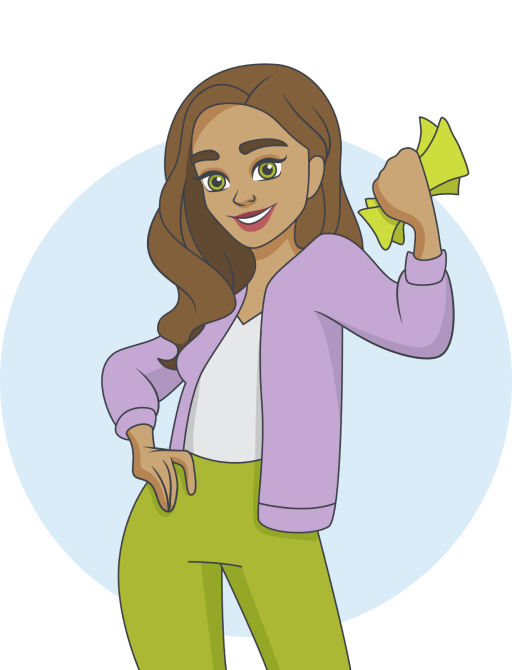 *Please note: YNAB does NOT receive commissions of any kind if you sign up for their services through the links above. I only recommend products I actually use, and feel great recommending this one.